Powers/Abilities: Giant-Man, using Pym Particles, can grow to giant-size, increasing his strength, weight, and durability exponentially the larger he grows. Giant-Man can also shrink to ant-size, and presumably to microscopic size, and has worn special armor to increase his powers as he grew to macro-size. Raz Malhotra is a trained scientist, specializing in robotics and biochemistry, and has shown the ability to modify individual Pym Particles. (Secret Empire: Brave New World#1/2 (fb) - BTS) - Mr. and Mrs. Malhotra immigrated to Denver, Colorado, from India to start a new life for their family, and had three children, Raz, Preeti, and Swapna. In time, Raz would get a degree in artificial intelligence and then relocate to San Francisco with his boyfriend. (Ant-Man Annual I#1 (fb)) - Months ago, in San Francisco, Raz Malhotra was hired by Egghead for technical support through his job with Techbusters. Egghead had read Raz's college dissertation, "Breakthroughs in Moral Paradigms for Artificial Intelligence". Raz confessed he had hoped for a career in robotics, but Hank Pym's reversal on the issue had led Raz to struggle in finding work. Offering a chance for revenge against Hank Pym, Egghead enticed Raz to help activate the A.I.Vengers, robotic duplicates of an old Avengers team, and used mind-control technology on him. Soon Giant-Man (Hank Pym) and Ant-Man (Scott Lang) arrived and freed Raz, who turned the robots against Egghead. Raz was fired from Techbusters. (Ant-Man Annual I#1) - While Raz was looking for jobs, and preparing to go with his boyfriend to meet friends Mike and Sunny, he received a package from Ant-Man containing a Giant-Man suit. (Astonishing Ant-Man I#4) - In his first outing as Giant-Man, Raz sought to stop Unicorn after a heist, but fell into a bridge, embarassing himself. (Astonishing Ant-Man I#5 (fb) - BTS) - Giant-Man battled Rommbu, not realizing he was being protected by environmentalists, and he damaged more property, further angering the public. (Astonishing Ant-Man I#5) - Giant-Man was trained by Ant-Man at small size in a Lego village, then they went to a conference held by the new Power Broker, and battled the new female Blacklash before she defeated them and helped Power Broker escape. 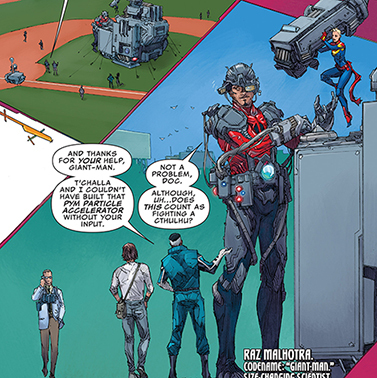 Ant-Man invited Giant-Man to Miami for a few months, to work on the tech in Hank Pym's old lab, including a Vis-drone (phasible surveillance technology). (Astonishing Ant-Man I#7) - Now on the team of Ant-Man Security Solutions, Giant-Man went with Machinesmith and Grizzly to help Miss Patriot at the Valhalla Villas. (Ultimates I#3) - Giant-Man aided the Ultimates in equipping their ship with Pym Particles, using his knowledge of robotics and biochemistry to program the Particles. (Mockingbird I#5) - Giant-Man appeared in a brief gathering of super heroes. (Astonishing Ant-Man I#9) - Despite the criminal nature of it, Giant-Man agreed to help Ant-Man break into Cross Technological Enterprises. He met the assembled team, some of them criminals: Ms. Thing, Beetle, Hijacker, Whirlwind, the Magician, and the Voice. In the heist, Giant-Man and Ms. Thing pretended to do an inspection and instead knocked out the power. (Astonishing Ant-Man I#10) - Ant-Man was captured and Stinger met with Giant-Man and the others. The villains all fled, but Giant-Man attacked Cross Technological Enterprises with Ms. Thing, Stinger, Machinesmith, and Grizzly. (Ultimates I#9) - Ulysses Cain predicted an alternate future to the Ultimates, who recruited Giant-Man in building a Pym Particle Accelator with the Ultimates to fight the Infinaut and avert the future. Equipped with Black Panther enhanced armor, Giant-Man grew to massive size and pulled the Infinaut to Earth, helping save him. (Astonishing Ant-Man I#13) - While off in space with the Ultimates, Giant-Man testified at the trial of Ant-Man over satellite feed, but the connection was lost. (Occupy Avengers I#8) - Giant-Man was among the Underground, preparing for battle with Hydra. (Captain America IX#25) - As part of the Underground, Giant-Man helped liberate the Inhumans from a concentration camp, and saw a Cosmic Cube Fragment obtained. (Secret Empire: Brave New World#1/2) - Returning from space, where he did tech support for the Ultimates, Giant-Man discovered that his boyfriend had moved on and Ant-Man Security Solutions had shut down. Machinesmith and Grizzly let him crash on their couch for a time, draining his savings, but they kicked him out when they went north. Taking the bus back to his home town of Denver, Raz found the city overrun by Hydra, and he called Ant-Man to find out what was going on. At his home, he saw his family: Mr. and Mrs. Malhotra, and his sisters Preeti and Swapna, being harassed by Hydra agents. As Giant-Man, Raz fought off Hydra, then he got his family with him to safety, picked up by Ant-Man and the Wasp (Nadia Pym). (Secret Empire I#1) - From the Underground's secret base at the Mount in Nevada, Giant-Man greeted Rayshaun Lucas, and took him to the Tony Stark A.I.. The city of Las Vegas was later razed by Hydra. (Secret Empire I#2) - Giant-Man was among the Underground, who split into different groups, some planning to kill Captain America and some to retrieve the Cosmic Cube fragments. (Secret Empire: Brave New World#2/1) - Giant-Man interacted with the Underground. (Secret Empire I#5) - Giant-Man built a time capsule, with the help of a self-designed artificial intelligence, to carry a message to the future to ask for help in defeating Hydra, hoping someone would come back in time to help. Then Hydra attacked. (Secret Empire I#6) - When the Underground broke out fighting, realizing there was a traitor in their mix, Giant-Man exposed a lie that the Tony Stark A.I. had told the others, then Ant-Man exposed himself as the traitor. Hydra used the Hulk to break down the Mount, defeating the Underground. As the Underground rushed to escape, Giant-Man released a team of robot Avengers, or A.I.Vengers, he had programmed to hold off Hydra. (Secret Empire I#7) - Giant-Man, among the Underground, heard about the death of Black Widow in a battle with Hydra. (Secret Empire I#8) - Giant-Man and Rayshaun Lucas buried the time capsule in the Arizona Desert. (Secret Warriors II#5) - The Underground arrived to help the Warriors liberate New Attilan and the Inhumans from Hydra. (Secret Empire I#9) - Giant-Man joined the Underground and many other heroes in final battle against Hydra. (Secret Empire I#10) - Hydra was finally defeated. Comments: Created by Nick Spencer (writer), Brent Schoonover, Ramon Rosanas (artists).